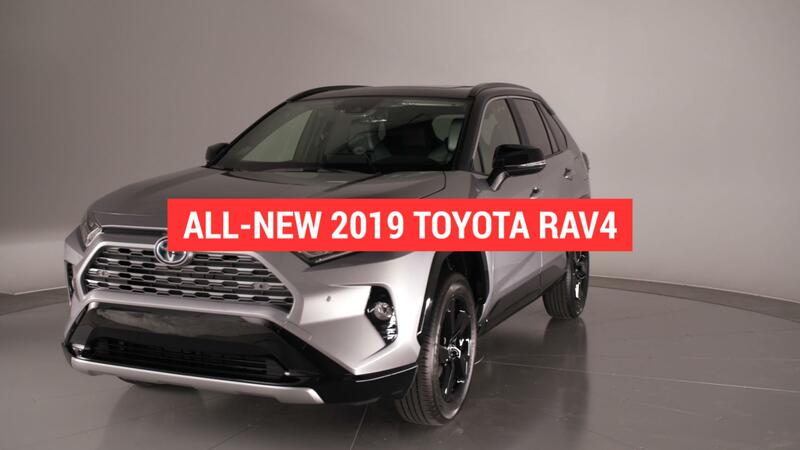 The 2019 Toyota RAV4 represents a bold new direction for what has been the bestselling SUV in America. With characterful styling, best-in-class power and an ulta-efficient Hybrid model, it stands above top rivals in key areas, while at least matching their quality, safety and tech offerings. It’s not quite as spacious any more, but few would deem it cramped. It also continues to benefit from Toyota’s strong reliability, resale value and included scheduled maintenance program. Really, anyone shopping for a compact crossover would be wise to consider the 2019 RAV4. Interior materials and finishes are good for the RAV4’s compact crossover class, and much better than past versions of the vehicle. Genuine leather is not available, and the SofTex vinyl that comes on up-level models isn’t a convincing substitute. Frankly, the RAV4 never achieves the near-luxury vibe that a Honda CR-V or Mazda CX-5 can. Still, we like the colorful trim pieces in certain trim levels, while there are plenty of niceties like ventilated front seats, heated rear seats, a panoramic sunroof and soft-touch materials covering the dash and doors. All RAV4’s but the base LE get a large, 8-inch touchscreen placed high atop the dash, which makes it easy to see and reach (even if it isn’t the best system to use). We appreciate that Toyota has included physical knobs and menu buttons to support this screen as it contributes to the system’s overall functionality (but it would be nice if some were bigger). Apple CarPlay is also standard, but Android Auto is not available. We also had trouble charging our phone with the available wireless charging pad. In-car storage is improved over the previous RAV4, and although it doesn’t have the uber-practical center console cubbies of the Honda CR-V, there’s still a grippy place to store/charge your phone (in theory), large cupholders, a sizable under-armrest bin, and shelves built into the dash. How big is the RAV4? The 2019 Toyota RAV4 is a bit bigger in a few dimensions compared to its predecessor, but in general, it’s less spacious and ultimately practical than before, or in comparison to uber-sensible rivals like the Honda CR-V and Subaru Forester. The roof is lower and passengers both in front and in the back may find things a little confining (especially with the optional sunroof). Rear seat legroom is basically mid-pack, but full-sized adults and rear-facing child seats should still fit comfortably enough. Cargo volume of 37.6 cubic feet with the back seats raised or 69.8 cubic feet with them folded is also less than those of key rivals (as well as the outgoing model). This is largely the result of that lower roof and a more raked tailgate area, but then they also contribute to the RAV4’s arguably improved styling. This would be the tradeoff, and honestly, we don’t think it should be that concerning for most shoppers. For instance, it still has more cargo capacity than a Ford Escape (34 and 68 cubic feet, respectively), while a dual-sided cargo floor (one carpet, one easy-to-clean plastic) and a hide-way cargo cover add some distinctive versatility. We would also be remiss if we didn’t mention the RAV4’s ample ground clearance, especially in the Adventure trim level, that contributes to it being one of the more capable compact SUVs off the beaten path. Only the Forester and a Jeep Cherokee Trailhawk are better at clearing impediments than the RAV4 Adventure, and even the lowest RAV4 — the XSE Hybrid — still clears 8 inches. The old model was in the low 6 range. There are two engine options for the 2019 Toyota RAV4. Most versions get a 2.5-liter four-cylinder engine good for 203 horsepower and 184 pound-feet of torque. No other base engine in the segment comes close to that horsepower, and a run from 0-60 mph takes an estimated 8.1 seconds. The RAV4 Hybrid gets a different 2.5-liter engine along with three electric motors that combine to offer up 219 horsepower. The electric motor at the rear effectively gives the Hybrid standard all-wheel drive. Its 0-60 estimate is 7.8 seconds, meaning the Hybrid is not only the more fuel-efficient choice, but the higher performance one too (albeit barely). The EPA rates the front-wheel-drive RAV4 at 26 mpg city, 35 mpg highway and 30 mpg combined. Those estimates lower only to 26/34/30 with the basic AWD system, while the more advance system gets cut down to 25/33/28. The EPA had not rated the 2019 Toyota RAV4 Hybrid as the time of this writing, but Toyota estimates that it will return 41 mpg city, 38 highway and 40 mpg combined. That would make it the most fuel efficient small crossover in America. What’s the RAV4 like to drive? With a stiffer platform and new-and-improved suspension and steering, the 2019 model isn’t the boring, anonymous crossover it once was. It may not engage like a Mazda CX-5, but there is still an eagerness to its turn-in and it demonstrates impressive poise while still offering a comfortable ride. There are Normal and Sport driving modes, but the differences between them were negligible. So too are the differences between the myriad trim levels. We’ve driven them all, and although the gas-only XLE perhaps felt a bit lighter and more playful, and the sport-tuned XSE Hybrid a bit more caffeinated in its response to inputs, there isn’t a massive gap. That’s just fine. Every RAV4 is better to drive than many competitors — not just some niche sport variant. In terms of the available engines, the base four-cylinder may stand out on paper, but in practice it’s merely acceptable for the segment and we found it a bit loud and buzzy. The Hybrid actually improves this, as it adds that initial kick of electric power to smooth things out. Still, prolonged acceleration reveals the typical Toyota hybrid drone. Ultimately, both of these engines are about providing good fuel economy without a penalty for drivability (there’s no throttle lag or unusual transmission programming, for instance). They succeed, but if you want more guts, you’ll have to look elsewhere. What more can I read about the Toyota RAV4? Our Quick Spin review of the off-road-oriented Adventure trim level, which boasts additional ground clearance and chunky good looks that we prefer over the standard version. Our Quick Spin review of the RAV4 Hybrid, which we found is very nice to drive despite its intended role as the fuel-sipping option. How does the Toyota RAV4 compare to other compact SUVs? In the pair of charts below, you can see how the 2019 Toyota RAV4 compares to all of its compact SUVs in terms of engine specs and dimensions. We have selected key figures that should help you determine which might be a better fit for your needs or tastes. What’s the RAV4’s price, and what features are available? Pricing for the 2019 RAV4 starts at $26,545 in LE trim, including $1,045 for destination. Standard equipment includes 17-inch steel wheels, LED headlights, roof rails, rear tinted glass, a full suite of accident avoidance tech (see Safety section), adaptive cruise control, a height-adjustable driver seat, cloth upholstery, a 60/40-split reclining and folding back seat, a 7-inch touchscreen (all other trims get an 8-inch screen), one USB port, Apple CarPlay, in-car WiFi, and a six-speaker sound system. From there, extra equipment is mostly added through the upper trim levels. Highlights include a power liftgate, a sunroof, proximity entry and push-button start, dual-zone automatic climate control, SofTex vinyl upholstery, a power driver seat, heated and ventilated front seats, a leather-wrapped steering wheel, driver memory settings, satellite radio, wireless smartphone charging, four USB ports integrated navigation, and a JBL sound system. The various trim levels, especially the XSE Hybrid and Adventure, feature different styling. You can compare the 2019 Toyota RAV4 trim levels and view local pricing here on Autoblog. The pricing of all trim levels is below, all with front-wheel drive unless otherwise noted. For the gas models, all-wheel drive is basically a $1,400 option, while the hybrid adds $800 beyond that. Every RAV4 comes with a comprehensive array of standard safety equipment beyond the expected and government-mandated items, including a driver knee airbag, a front passenger under-seat airbag, forward collision warning with pedestrian detection and automatic emergency braking, and a lane-keeping assist system. Blind-spot and rear cross-traffic warning systems are optional on the LE trim level and standard on all others. A rear cross-traffic automatic braking system is standard on the Limited and optional on all trims but the LE. The 2019 RAV4 had not been crash tested by a third party at the time of this writing, but it’s hard to imagine it’ll do worse than its predecessor, which received a Top Safety Pick award from the Insurance Institute for Highway Safety.